BACK TO ROCK REDWOOD CITY! 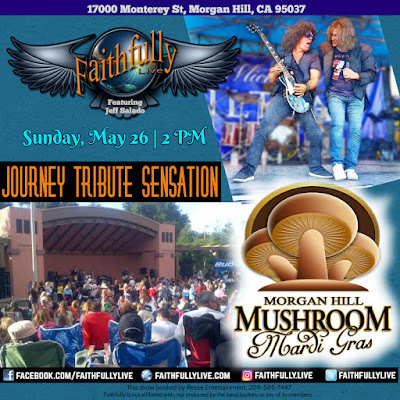 Experience the most exciting tribute to Journey -- FAITHFULLY LIVE -- featuring the spot-on vocals of Jeff Salado honoring the legendary Steve Perry! LIMITED-SEATING EVENT! We sold out our show in January, so let's do it again! Ticket link up soon for a great concert at Angelicas' fine dining establishment! If you love 80's classic rock, you'll love Faithfully Live featuring Jeff Salado! The band takes you through Journey's Steve Perry years -- from 1978 through 1986 -- performing all their top hits. The five professional musicians of Faithfully Live come together to pay tribute to Journey delivering songs you love -- Wheel in the Sky, Just the Same Way, Don't Stop Believing, Faithfully, and more. Audiences will leave a concert wanting more -- the energy and stage presence are elevated to a whole new level. Faithfully Live currently entertains audiences all over the U.S., providing an electrifying live show. No matter where they play, it's a guarantee the audience will sing along and be up on their feet. The band continues to build its fan base, with over 76K fans on Instagram and over 14,000 followers on Facebook. Come out and join the fun! Disclaimer: Faithfully Live featuring Jeff Salado is not affiliated with, nor endorsed by the band Journey or any of its members. 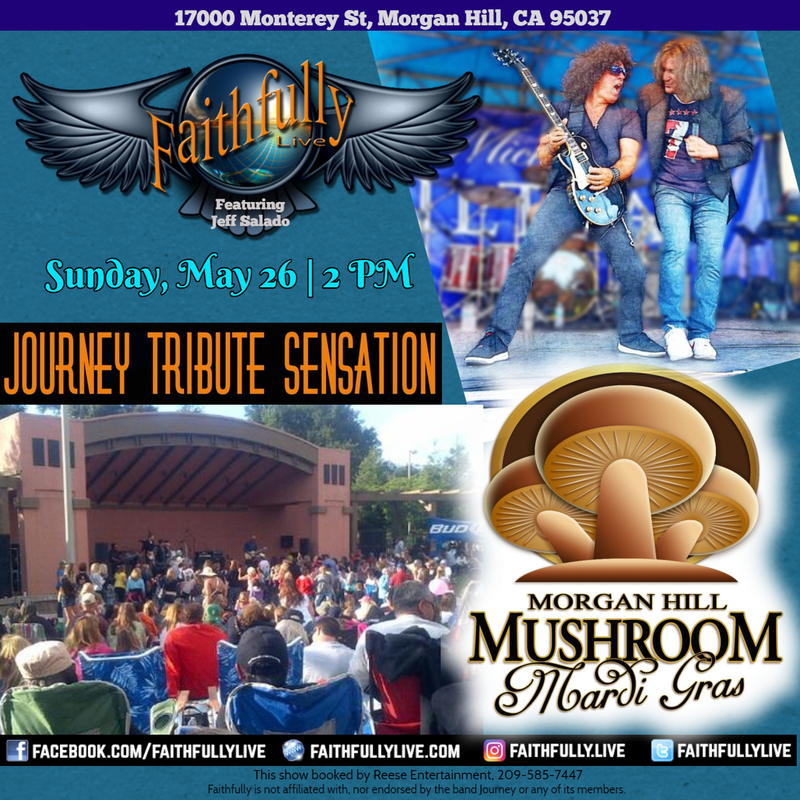 Experience Journey Tribute Sensation Faithfully Live, featuring Jeff Salado, at the Morgan Hill Mushroom Mardi Gras Festival - FREE SHOW! FAITHFULLY LIVE featuring Jeff Salado makes audiences groove to the dynamic instrumentals honoring Journey in their heyday! The band captures Journey's soulful ballads, melodic rock, and bluesy swagger...and Jeff Salado's gifted, soaring vocals and stagecraft honoring Steve Perry will make you believe! Join us for energetic, crowd-stirring recreations of those landmark Journey tunes you love -- Don’t Stop Believin’, Anyway You Want It, Faithfully, Lights, Separate Ways, Open Arms, Loving’ Touching, Squeezing, Anytime, Who’s Crying Now, Just the Same Way, Stone in Love, Wheel in the Sky and more. Journey Tribute Sensation Faithfully Live returned to Redwood City's Angelicas on January 19 and it was a night to remember!